Should Kids Be Taught About Persecution? kids with real Kids of Courage at risk for their faith today. A child in North Korea explains to her teacher that she did well on a test “by God’s grace.” Later, she arrives home to find her parents have disappeared. Such stories in a new Vacation Bible School curriculum from The Voice of the Martyrs have some children’s spirituality experts questioning whether it encourages children’s faith or burdens them with inappropriate information, reports Christianity Today. Launched last year, the Kids of Courage curriculum “came about as a result of churches’ desire and [our] desire to tell the story of persecuted Christians in an age-appropriate way,” said VOM-USA’s media director, Todd Nettleton. Church for the Harvest in Alexandria, two hours northwest of Minneapolis, used the curriculum last summer. 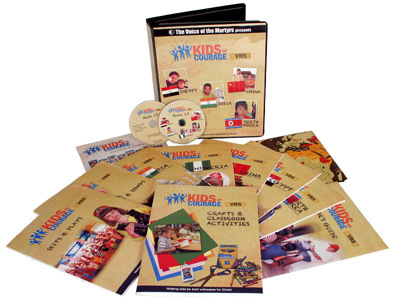 Children’s director Katy Kiger is a former missionary to South Africa and liked that Kids of Courage includes stories from China, Egypt, India, Nigeria, and North Korea. For example, stories from Nigeria talk about Muslims converting to Christianity as well as terrorists attacking churches. “The kids here need to know what is up in the world today,” said Jalil Dawood, pastor of the Arab Church of Dallas, whose members and their families have faced death and severe persecution in their home countries. His church hasn’t used the program, but Dawood says it is important for American children to learn about the challenges of being a Christian in other parts of the world. Still, telling stories of God’s presence with his people who suffer on his behalf has a long history. “Jewish children heard the stories of Daniel and Shadrach, Meshach, and Abednego,” said Holly Allen, professor of Christian ministries at John Brown University and author of Nurturing Children’s Spirituality. Stories of suffering in the mission field have been told to children in recent centuries. We’d love to hear your thoughts. Do you think kids should be taught about persecution? Why or why not? For more information, or to view and hear samples from the Kids of Courage VBS Curriculum, click here. Canadians can order the curriculum from our online resource catalogue or by contacting our office.